We are back in the office after a fantastic day at the National Space Centre in Leicester for the Oxford and Cambridge Colleges IT Conference on Friday 22nd March. The brilliant keynote from Grant Caley, NetApp’s Chief Technologist for the UK & Ireland set the tone for the day. Grant covered how data is key to both organisations today and well into the future, and how the NetApp Data Fabric concept is the link that brings it all together. 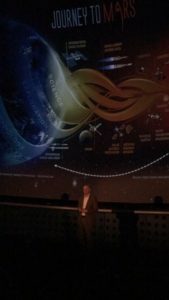 Some key takeaways were given to the delegates gathered in the Sir Patrick Moore Planetarium, including “You need to think about mobility of data when building a data fabric, you want an easy link between on-premise and cloud”, and an insight into a future where “Data will become self describing and self governing. For example it will know when it cannot leave a certain geographical area for GDPR purposes”. The keynote was followed by a day of excellent conversations during the exhibition, where delegates came to S3’s stand to discuss how transforming technology impacts Oxbridge colleges and take the opportunity to climb the rocket tower above the exhibition area! The exhibition was followed by the opportunity to watch a short film in the planetarium, before being treated to dinner in a unique setting amongst the exhibits, including a Soyuz Capsule suspended overhead! 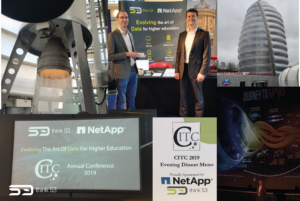 Thank you to everyone who visited our stand and to NetApp for their amazing support of the day, and we look forward to continuing the conversations we started and expanding on the range of transformative solutions NetApp can offer for Higher Education.